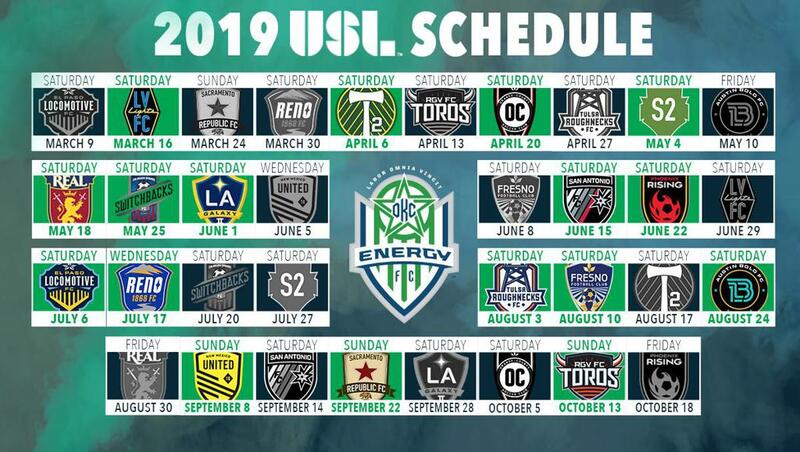 Energy FC and the United Soccer League announced the schedule for the upcoming 2019 season today. The Greens will play 34 matches over 33 weeks in what will be the biggest year in the league’s history. Energy FC begin the season on the road Saturday, March 9 at Southwest University Park in El Paso, Texas against expansion side El Paso Locomotive FC. The home opener, presented by Mercy Health, will be the following weekend on Saturday, March 16 at 7:30 p.m. at Taft Stadium against Las Vegas Lights FC. That day will begin and end with Green, as the club will once again host the annual St. Patrick’s Day Parade in downtown Oklahoma City that morning. The first installment of the 2019 Black Gold Derby against in-state rivals Tulsa Roughnecks FC will take place on April 27 at ONEOK Field in Tulsa, Okla., while the return fixture will take place on August 3 at Taft Stadium. Home matches for Energy FC will kick off at 7:30 p.m. from March through May. Start times will then move to 8 p.m. through August. The last three home matches, all on Sundays, will kick off at 6 p.m. In addition, the only midweek home match will be on July 17 against Reno 1868 FC. With 18 teams in the USL’s Western Conference, each team will play a home-and-home series against all opponents. The 2019 USL Playoffs will expand to include 10 teams from each conference, with the lowest four seeds in each conference opening postseason play in the Play-In Round. The single elimination format will then continue for the following four weekends in a fixed-bracket format with the higher seed in each matchup serving as host through the conference finals. The 2019 USL Cup will be held from November 14-18 and be held by the conference champion with the better regular season record. You can become and Energy FC Season Seat Member by visiting energyfc.com/together or by calling the Energy FC office at 405.235.KICK (5425).